This is where I post about exhibitions, projects and other arty explorations. I'm very excited to announce that I am now creating a new series of adornment pieces. I have always loved to wear handmade jewelry and accessories by local artisans. Adornment is a way that I express myself, so it makes perfect sense for me to use this as a new medium for my work. Art you can wear. The complete collection will be revealed this spring! There will be necklaces, earrings, and also some pins for those of you who like to wear the unique. Come sip some wine and try on a piece or two. RSVP here to my Facebook event. In the window of my studio is my very first collaboration my studio mate, Jessica De Haas. This has been a deeply satisfying project for both of us. This exhibit is part of a Textile Walk on Granville Island for the Textile Society of America’s conference here in Vancouver, on until Sept 30. Our exhibit will stay up much longer than that, and Jessica and I have been so inspired, that we are pretty sure that there will be more to come from the two of us. "Inspired by amulets that have been used for power and protection since ancient times, and fishing lures that are designed to attract and catch what you wish, these pieces represent personal power and strength, as well as the ability to bring to you the things you want in life." New Studio on Granville Island - Opening Party! After many years of wishing and hoping, I finally have a studio on Granville Island, just walking distance from my home. 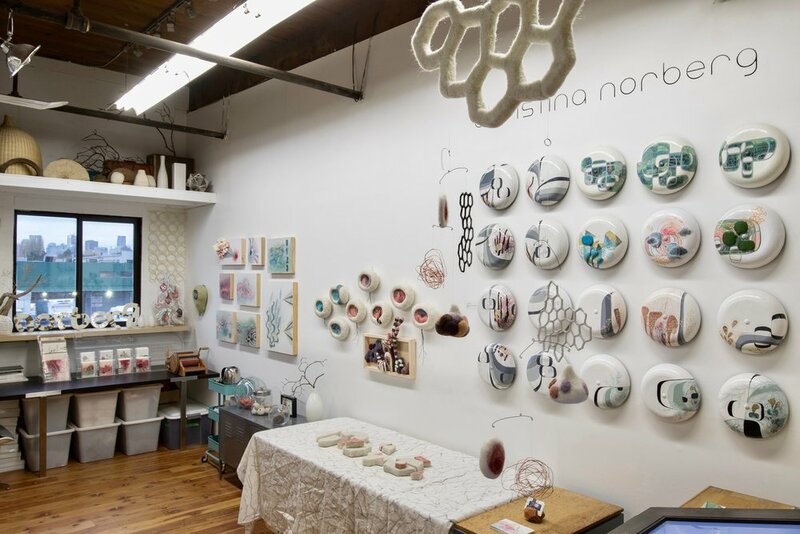 Located in the Railspur Artisan District, my new studio also has a small retail space, which I share with my friend and fabulous textile designer, Jessica De Haas of Funk Shui Felt, who has been in this great space for the last eleven years. Come help us warm up the studio with a party! I have two new series of work, (painting and sculpture), that I can't wait to show you. Visit my Art Nights page to see upcoming dates. Thank you to everyone who came by the studio for the Eastside Culture Crawl this past fall. I was very sick with a cold, so my superstar husband stood in my place for all four days. What a guy. Below are some photos of the studio right before the event. This was my 10th Eastside Culture Crawl, and my last. I will be moving into a new studio in a neighbourhood outside of the Crawl boundary. Stay tuned for the new location! Well, it seems I've long been neglecting this part of my website, so it's time for an update. I will be opening up my studio this November for my 10th Culture Crawl! Please come on by to see my new work, and to check out the work of hundreds of other artists and makers. Whether you're looking for art or not, come have a beer with me at the opening. The show will be up for the month of August. It's that time of year once again. I open up my studio, along with 400 other artists, for all of you to come see what we do and maybe even buy some art. I am co-hosting a Vancouver Draw Down event with artist, Rachael Ashe. This Saturday, we invite you to create a collaborative, large-scale drawing with us. We will be using simple techniques. so no drawing experience is necessary. This FREE event is presented by Creative Mornings Vancouver and Emily Carr University of Art & Design, and is open to everyone. Some of my drawings will be in an upcoming collaborative group show called, "It's All in the Details". The Jewelry Artists Collaboration have used their inspiration from the work of artists in other media, to create a show of one of a kind rings. The ring above was inspired by one of my drawings (shown below the ring). Work from both the inspired and the inspiration will be on display. Hope to see you there. My work was selected to be painted on planters on Hastings Street in the Downtown Eastside, in Vancouver, BC. This is part of the Hastings Urban Tree Nursery project created by the Strathcona Business Improvement Association. The project's intent is not only to add vibrancy and beauty to a very unique neighbourhood, but also to encourage community pride and connection, as members of the community care for and nurture the young trees. When the trees grow large enough, they are auctioned off, replaced with new young trees, and the cycle begins again. This was such a rich and enlightening project for me. I have long had compassion and some semblance of understanding of what the residents of this neighbourhood go through, and what has transpired to create their current reality. Being right there, in the thick of it, in front of VANDU, for hours and days on end, allowed for a whole new window of understanding, and opportunities for connection. For the days I was working there, I saw some of the poverty, addiction, and dysfunction that residents face everyday. I was prepared for that. I expected it. What I didn't expect was all of the beauty. I saw so many supportive relationships and interactions. I saw community and caring. People looked out for each other. They shared their stories with one another. They are clearly a tight community. Tighter than any I have ever lived in. As I painted, residents unabashedly showered my work with compliments, encouragement, suggestions, and overwhelming gratitude. I'm sure that in those three days, I had heard almost a hundred positive comments from passers by. I was deeply touched. Also enlightening to me were three of the interactions I had. One was with a very angry resident, while the other two were with people who worked to support residents in some capacity. Their comments made me aware of the politics involved in the area. It wasn't enough that I was adding artwork to the community. They wanted to know why I was painting there. They wanted to know whether I was paid, and who had asked me to do so. The answers to these questions seemed to dictate whether my work was of any value to the community. In my opinion, they had missed the point. They didn't seem to be listening to all of the people who had shown me so much gratitude and appreciation. It made me think about how often the politics of the Downtown Eastside gets in the way of actually helping people. Spending time here, having conversations with the members of this community, reminded me that we cannot judge a person before we've learned their story. And even then, forget the judgement. We are all just humans doing the best we can with what we were given. I hope that this doesn't come across too sugar-coated. I really just wanted to share my experience. I know this is a controversial and complicated area, and that many people have strong views about the issues that the neighbourhood faces. I look forward to painting in this neighbourhood again in the future, and seeing the faces of the many lovely humans that I met there. This is my third year in a row submitting a piece to this very fun art auction. Come check it out and bid on a piece! Bid on 50 select artists’ interpretations of a vessel • iremono. Lonestar Yakuza Taco Bar by Open Sesame. Fujiya sushi samplings, cash bar, live entertainment, raffle prizes and more! Online preview and pre-bidding available now. Photos from my booth at The Artist Project Contemporary Art Fair in Toronto this past February 2015. I've been invited to participate in The Love Letter Project. Artists choose a letter, that had been written to someone who is going through a challenging time, and create an artwork in response. The artwork and letters are being published into a book. Come to the book launch and art show on Friday, February 6th, 2015 - 6:30pm. In February I'll be back in Toronto exhibiting in The Artist Project Contemporary Art Fair. This will be my second time participating in this elegant, high-quality show. Can't wait! I'll be showing off a brand new series of paintings. Watch this space for photos of the event. My fire-alarm bell paintings have been featured on a great upcycling blog, called "Upcycle That". I really like their clean, straightforward way of presenting their posts, and their content is quite inspiring. "Feltanicals" are now available in my online shop. Feltanicals are my new line of felt sculptures for the home or workplace. Placed in a bowl, a vase, or nestled on a shelf, Feltanicals are small, touchable art pieces. Mix and match them to create your own arrangement, or have them stand alone. 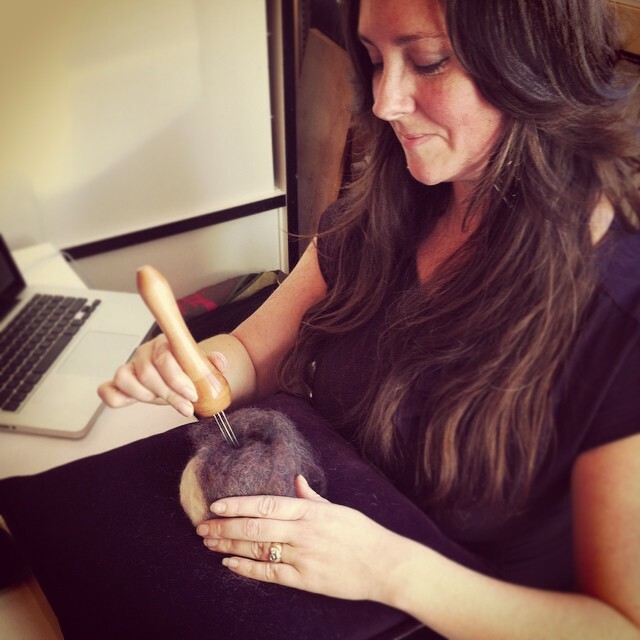 Each one-of-a-kind Feltanical is needle-felted by my own hands, and involves hours of work. Made with a combination of alpaca from Alberta, and wool from New Zealand, these tactile sculptures provide a calm, soothing experience when touched. Some are already available in my online shop. More will be added soon. They can also be touched, squeezed, and purchased at my studio in Vancouver by appointment. I am pleased as punch to be a part of this carefully curated fine art, craft and design show. I know many of the artists in this show, and the talent is incredible. A must see. Here's a video of a previous show. I'll have mobiles, felt sculptures, drawings, cards, and fire-alarm bells for sale. See you there. A Wonderful Culture Crawl 2014! A huge thank you to everyone who came to my studio at the Eastside Culture Crawl this past weekend. Whether you purchased something, stopped by for a visit, or encountered my work for the first time and shared your impressions, your being there meant so much to me. This year was a year of firsts, after 6 years of doing the crawl. This is the first time that I had so much work available. Between January and November of this year, I had created forty-two mixed media paintings on fire-alarm bells, and ninety original drawings from my Drawing Can be Scary project. I made five new mixed media, geometric sculptures. I introduced mobiles for the first time, which were a sell out. This was also the first year that I decided to sell stationery cards of my work, and hand-sewn infinity scarves with my prints on them, and I launched a new small felted sculpture line, called "Feltanicals". (Which were also a big hit.) Phew! I can't believe I got it all done in time. Lastly, I was inspired by artist, Michelle Sirois-Silver, to do demonstrations of my work during the crawl - something I will definitely be doing again in the future. Crawl participants were delighted and inspired. I'll be writing another post announcing my Feltanicals shortly. All of the work that I still have available, will be in my Big Cartel online shop very soon, for your perusal. Thanks again, and I hope you enjoyed your Culture Crawl experience as much as I did! New! I now have a couple of Online Shops. After much deliberation, and tons of researching various online store platforms, I've decided on two ways to make my work available for purchase online. I hope these will meet your online shopping desires. (I do love the convenience of shopping from the comfort of my home, and then having it arrive later at my door!) Both of these shops will be updated continually, so check back regularly to see what's new. Big Cartel is where you will find my available original paintings and drawings, as well as things like custom-printed pillows. Society6 is where you can purchase prints and cards of my work, as well as other products like iPhone cases and clothing with my designs on them.